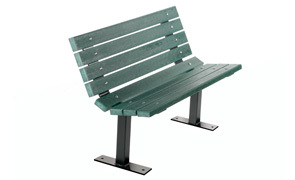 These contoured beauties are the recycled plastic benches of choice for high traffic areas. 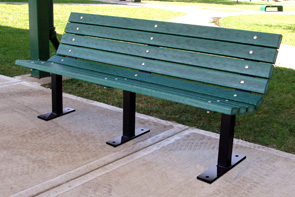 Eight 2" x 4" resinwood slats sitting on a heavy-duty black powder-coated structural steel frame, these recycled plastic benches are available in both in-ground and surface mount. The recycled plastic resinwood slats are available in an array of color options. Some assembly required. ►Need a Contour Bench Fast?